Musicians Tegan and Sara, with their seventh album, Heartthrob, and a decade-plus experience under their belts, lead the pack of accomplished leaders in politics, sports, science, religion, and the arts named to our annual "40 Under 40" list. The twin sisters from Western Canada are seasoned pros at 32. 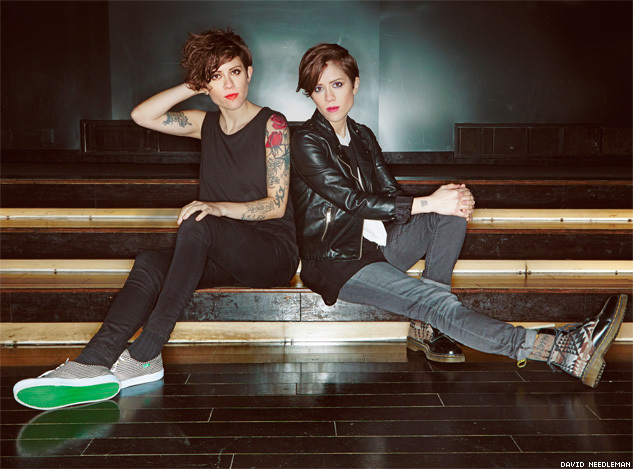 Tegan and Sara Quin have been known to many queer and folk/indie rock fans for over a decade. In fact, they’ve been writing music a full half of their lives now. They were signed to a record deal at the tender age of 19. “Now I guess 40 for me is like 50 — that’s what I’m thinking,” Sara continues. So 50 is when one is a fully formed adult? The night before the interview, Tegan and Sara finished a two-night set of shows at New York City’s Beacon Theatre. They’d just started a tour for their seventh album, Heartthrob, a pumping, synth-driven chart-topper that is a departure both in style and ambition for the duo. For Tegan and Sara, those first loves were shared by a zillion grade school girls: New Kids on the Block. “We were like, We want a piece of them,” Tegan says. It’s really not about Joey or Jordan. Both women are openly lesbian. At age 19, Tegan and Sara were signed to Vapor Records, the label run by Neil Young’s manager, Elliot Roberts. As soon as the press requests came in, Tegan and Sara, both of whom were out to their families, had to contend with being out publicly. EXCLUSIVE VIDEO: The chart-topping heartthrobs sit down for an exclusive interview at the start of their tour for Heartthrob to talk about New Kids on the Block, the resurgence of rave, and what it was like to be openly gay from the very start of their professional careers at age 19.